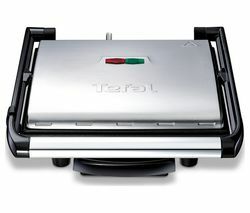 Grill like a pro with a Tefal grill that pretty much guarantees great results, from rare to well-done. 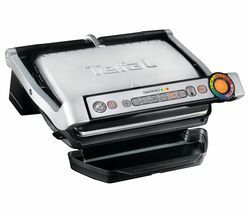 Giving you effortless control over what you're cooking and the flexibility to switch between six cooking programs, the Tefal Optigrill XL GC722D40 is a model of versatile, easy-to-use grilling technology. Showcasing an array of features that have been expertly designed to remove the uncertainty from your cooking, this ingenious grill makes the delicate art of grilling fool-proof. Our Tefal grills are up to the task, whatever's on the menu. 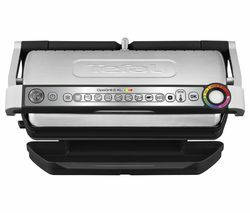 the TefalOptigrill XL GC722D40 features nine cooking programs for different types of food, so you can cook anything from juicy burgers to delicious fillets of fish. And, thanks to a removable drip tray that captures the fat as you cook, your meals will healthier. Further features that promise to help you achieve delicious results every time you fire up your grill include automatic sensor cooking that adjusts the grill to the right temperature according to the size and thickness of your food. A cooking level indicator that monitors progress while you're grilling also enhances your chances of dishing up perfectly grilled ingredients. Even better, when the cooking's done you won't have to slave over the sink – The Tefal's die-cast aluminium plates provide a non-stick cooking surface that's easy to clean. Our collection of Tefal grills also includes the accessibly priced Inicio GC241D40 and the OptiGrill+ GC713D40 Health Grill, which employs a 7-degree inclination to drain the ideal amount of fat and ensure your ingredients are extra-healthy. Check out our collection of George Foreman grills to see the latest models from the man who started the craze for fat-draining grills. Our kitchen department also offers a choice of the latest Sage Tower and Russell Hobbs grills.